The rolling waves of the Arabian Gulf can be seen through the windows in the treatment rooms, serving as a reminder of your sublime beach surroundings at Iridium Spa at The St. Regis Saadiyat Island, Abu Dhabi. Meaning “of rainbows,” the word Iridium comes from the mythological goddess Iris, who created a fabled jeweled path connecting earth to the sky and manifested herself as a rainbow — though you’ll find a much more serene, neutral color palette in the deity’s namesake spa. Flooded with natural light, the airy space serves as a retreat for a personally crafted day of pampering. Start your stay with a signature tea ritual before moving on to a respite in the dimly lit relaxation lounge or a plunge in the whirlpool, and that’s just the beginning. The resort’s exclusive beachfront address allows for a wide range of treatments unavailable to other hotel spas in the city. 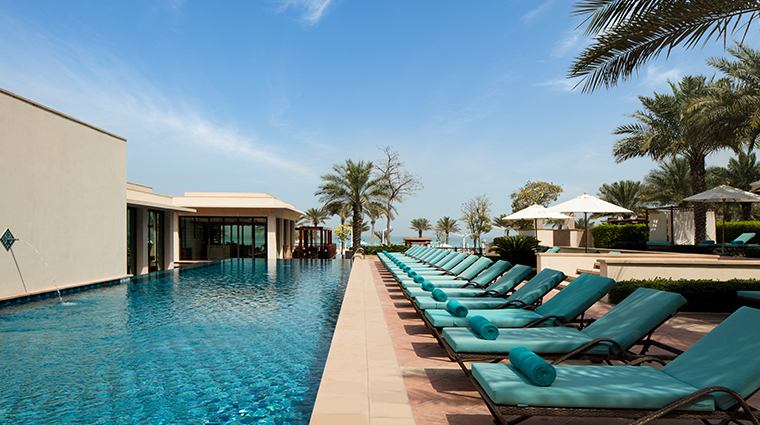 Oceanside cabanas, for example, provide the ultimate in alfresco wellness with a unique menu of offerings — cold stone therapy is a pleasant antidote to Abu Dhabi’s infamous heat. Book an outdoor treatment to not only enjoy the crescendo of crashing waves, but also a complimentary 15-minute cooling neck and shoulder massage with soothing aloe gel and an application of sunscreen. 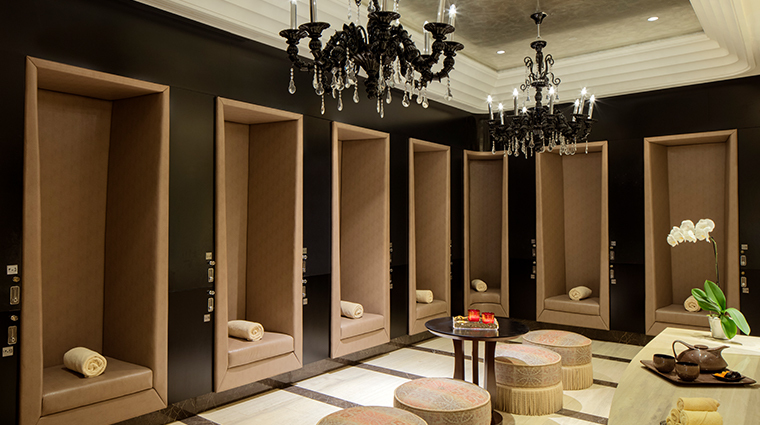 Gothic chandeliers softly light the vast and labyrinthine spa. Delicate bronze bonsai and white orchid petal cutouts, china teapots and willowy candles add to the sense of serenity. Don’t miss the chance to indulge in the relaxation room, which is replete with soft recliners and adorned with tiers of patisserie, canapés, tiny sandwiches and flaky scones with dollops of cream. All five senses are indulged at this Abu Dhabi spa, where scents of jasmine entice as you walk through the door and the Spa Blend tea (a caffeine-free red leaf with aromatic almond and sweet orange spice) is a luxurious sip. Though this luxury spa is all about honoring your time, it is recommended that you arrive at least an hour before your appointment to fill out a consultation form and indulge in the sumptuous facilities. Iridium Spa therapists tailor treatments to suit your mood, allowing you to choose whether you want to be energized or relaxed. As opulent as the beachfront cabanas are, a treatment here does not offer you access to the spa’s sublime facilities. 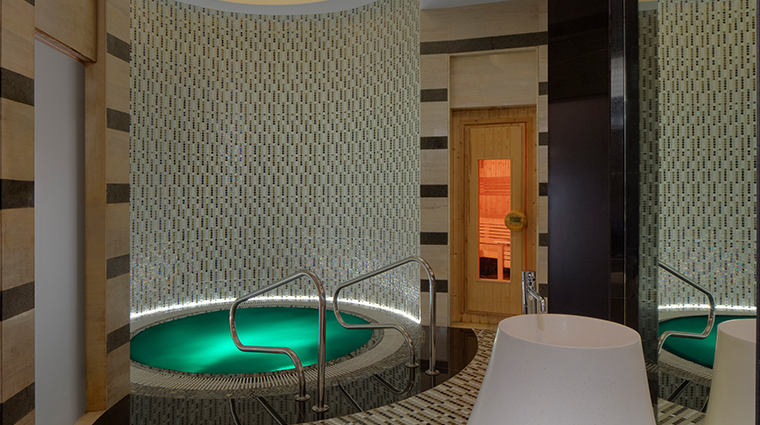 Ultra-luxe products, such as Natura Bissé and Amra, add an elegant touch to the Abu Dhabi spa's signature services. Firm local favorites, massages are top picks on the spa menu. The Sense of Calm is a result-oriented aromatherapy massage meant to help calm a racing mind, while the Sense of Balance is a traditional Thai option that releases muscular tension and renews energy. Regenerate and revitalize your skin’s natural elasticity using Iridium’s exclusive Futur Lab 3tox alternative to Botox. Using mesotherapy, the procedure delivers vitamins, minerals and amino acids into the mesodermal layer of tissue under the skin. 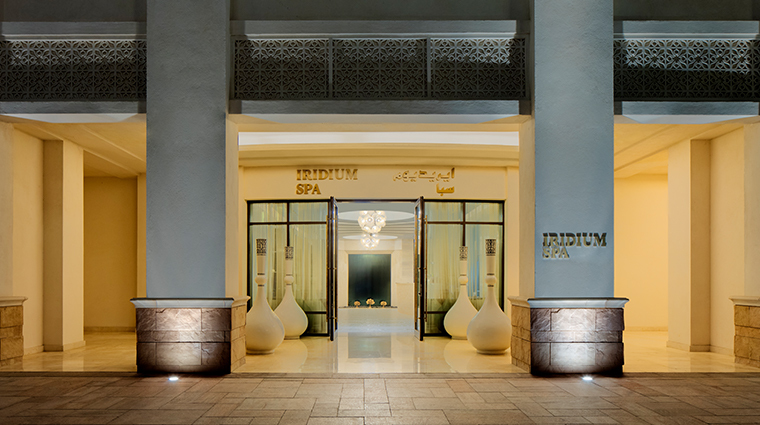 For a treatment original to the Middle East, opt for one of Iridium Spa’s hammam experiences. The 60-, 90- and 120-minute offerings are ultra-luxurious and will leave your skin glowing after an application of olive soap infused with argan oil and a Kese mitt exfoliation. Orange blossom or patchouli flowers imported from North Africa’s Atlas Mountains transport hammam lovers to bliss. The service is made even more delectable when a sumptuous dessert is served after the pampering. Iridium Spa’s Signature Time Rituals are the ultimate indulgence, combining multiple treatments into a pampering package. The 180-minute Roses & Diamonds Ritual, for example, begins with a gemstone-infused body exfoliation followed by a customized full-body massage with rose oud oil and an Illuminating Diamond Facial treatment. This beachside spa offers 12 bright and airy treatment rooms (including a couple’s suite), some with ocean-facing windows. There are three dedicated spa suites with private terraces and pools. Choose among Moroccan, Thai or contemporary-themed accommodations for customized pampering. Separate men’s and women’s facilities have slightly different aquatic experiences, but both include a sauna, steam room and Jacuzzi. The women’s side of the spa provides a luxurious rain shower, while the gentleman’s facilities include an ice fountain and a plunge pool.